Ali Al Massedy was 3 feet away from Saddam Hussein when he died. The 38 year old, normally Iraqi Prime Minister Nuri al-Maliki's official videographer, was the man responsible for filming the late dictator's execution at dawn on Saturday. Ali said he was not authorized to disclose the location, and did not give other details of the room. He would not give the names of officials in attendance, though he estimates there were around 20 observers. Mullah Obaidullah Akhund, a former Taliban defence minister and top insurgent commander, also said Saddam's execution on the Eid al-Adha Muslim festival -- marking the end of the annual pilgrimage to Mecca - was a provocation. Question: Was Saddam really killed today? Or was it a look alike? 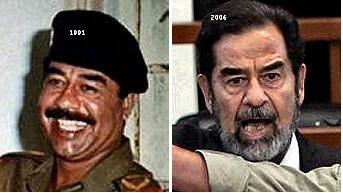 [and from another] Was the fake Saddam betrayed and murdered, or was his death faked. What would happen if the real Saddam maDes his presence known? ZetaTalk Answer: What is known, from the time of the supposed capture of Saddam and killing of his sons, is that this is neither the real Saddam Hussein nor his real sons. Nor did anyone die during this supposed hanging. The real family escaped, to a place the US with their espionage arms cannot reach. Just as Bin Laden hides in the hills of Afghanistan and Pakistan and Iran, even traveling to Turkey on occasion, just so Saddam and his sons are deep in the territory of a long time ally, Russia. Bush bombastically announced the pending invasion of Iraq, giving adequate time for anyone to leave. We stated at the outset that there would be no regime change nor would Bush and Blair gain the control over the oil fields they lusted after. What is occurring is an evacuation, with the Bush administration clinging to the hopes they can still hang on somehow, magically. Bush is rejecting all advice he supposedly sought re Iraq, fresh ideas, and stubbornly insisting on sending in more exhausted troops. This is the opposite of what the American people and the new Democratic leadership of Congress want, but intent on getting his way he and his fellow conspirators have concocted a way to stir up violence, or so they hope. The timing of the supposed hanging, on a holy day, was not by accident. Just as the US was responsible for the bombing of the Golden Mosque, they are also responsible for the timing of this charade by those parts of the Iraq government well in hand. Who were the witnesses? A handful of politicians fearful that the Americans will pull out, leaving them to the wrath of whatever faction in Iraq they have insulted. It was Saddam's cousin on trial all those months, a fact easily proven by close examination of the teeth of these two men. Saddam with perfect teeth and a normal bite, and the cousin with crooked lower teeth and an overbite. Never mind that the CIA claimed the captured cousin was indeed Saddam, based on DNA. Does the CIA lie? Now what? There may be slightly more sectarian violence, but not the flash point to allow Bush to impose a draft in the US or an invasion of Iran, his fond hopes. Instead, there will be the steady press to evacuate, as the civil war will continue, separating the country into pieces so the Kurds and Shia hold the oil fields, and the Sunnis merely hold the war machinery that Saddam formerly commanded. After the US and Britain are forced out of the country, Saddam will return to command the Sunnis, reinstating his regime. End of story. It wasn't Saddam! See Signs of the Times #540-541. And it wasn't his sons they killed in that shootout, either. See Signs of the Times #139. This year Russia has registered the highest number of unfavorable and dangerous natural phenomena in the history of meteorological observation, a director of Russia's Hydrometeorology Center said Thursday. Roman Vilfand said that between January and November, 371 dangerous natural phenomena - including extreme cold, heat waves, strong winds and driving rains - were registered throughout Russia. Britain is on course for the warmest year since records began. The record beats the previous two joint hottest years of 1999 and 1990 by 0.21C. Temperatures in central England have been recorded since 1659, the world's longest climate record, and they indicate the trend towards warming weather across Britain as a whole. Farm exports are expected to be hit by the country's worst drought in over 100 years. Question: Nancy, would the Zeta's like to comment on what is happening on the televisions as to why evert single little event in the weather is now proclaimed as a severe weather advisory, such as small patches of fog, or even drizzling rain? Or even the torrential rains that never come? ZetaTalk Answer: The cover-up at first involved subjects that were not to be discussed in the media. Simple enough. Then when the weather could not be predicted, predictions countered almost as soon as uttered, the weatherman looked perplexed and apologetic. To avoid having the public frankly alarmed that they were not warned, a new policy was formulated. Anytime there is a possibility of a disaster, say so, as the public will forgive you for erring on the side of safety. Disasters not predicted ahead of time result in an angry public. Disasters predicted but not occurring are forgiven. Such is the logic. And did the Zetas predict this in the past? Yes indeed, in 1995. ZetaTalk: Mankind will find its greatest problems with the weather to be its unpredictability. Areas of the world which have been deserts throughout mankind's memory will become swamps under constant and repeated rains. Temperate climates used to periodic gentle rainfall will suffer intractable droughts. Then this will switch about, for no apparent reason. The reason lies deep within the Earth's core, an area the meteorologists refuse to consider, and thus their predictions on the atmosphere will never be based on the right parameters. ZetaTalk: Weather irregularities will continue in the manner we have described since 1995, with increasing swings and extremes. In that weather irregularities are smoothed, by nature, by increased atmospheric activity or ocean currents, temperature extremes will not occur. Rather, oscillating extremes, similar to what the world has already experienced, will occur. Sudden shift to cold weather, sudden unseasonably warm weather, and the like. Snow in Summer is a pole shift predictor. During the time of the last pole shift, this occurred, of record, in China. Written during the reign of Emperor Qin c.1600 BC. In the twenty-ninth year of King Chieh, the Sun was dimmed... King Chieh lacked virtue... the Sun was distressed... during the last years of Chieh ice formed in mornings and frosts in the sixth month. Heavy rainfall toppled temples and buildings... Heaven gave severe orders. The Sun and Moon were untimely. Hot and cold weather arrived in disorder. The five cereal crops withered and died. Snow in Summer has arrived again, on Jun 12, 2000 in Somalia, an equatorial country. And now, in Argentina and Australia in the middle of Summer there! Snowfall in Somalia in June, the first snowfall ever for this tropical country on the Equator. Residents of Altas Cumbres are stunned. The event is highly unusual since up to only three days ago, they were basking under 36 Centigrade (94 F) temperatures and are currently enduring subzero conditions. The event has been described as "unusual" and "unheard-of" by local residents, given the time of the year. Yes, this is Australia. Snow, and plenty of it, doused the alpine bushfires, transforming the blackened landscape in Victoria's east into a brilliant white. Just days after fearing deadly fires would destroy their mountain, residents atop Mt Buller, northeast of Melbourne, were hurling snowballs at each other and shaking their heads in amazement. And did the Zetas predict this in the past? Yes indeed, in 2000. ZetaTalk: As we stated in 1995, severe and intractable drought, drought and deluge swings. Very cold summers, relayed in the past, in ancient reports of what the Chinese called a world cycle, meaning the approach of another pole shift, where snow fell in summer. Due to rising seas or subducting land, islands have been disappearing in the South Pacific and off the coastline of India. One of the countries is Kiribati, which comprises 32 atolls and has a population of over 90,000 people. Most of the land is just thee metres above the sea level and the country's president Anote Tong, who is attending the summit, says he will have to depend on Australia and New Zealand in case of a calamity. The other Pacific nations feel threatened by climatic changes are Tuvalu, the Marshall Islands and sections of Vanuatu and Papua New Guinea. Some 3,000 people from Tuvalu are being moved and resettled in New Zealand now. The obliteration of Lohachara island, in India's part of the Sundarbans where the Ganges and the Brahmaputra rivers empty into the Bay of Bengal, marks the moment when one of the most apocalyptic predictions of environmentalists and climate scientists has started coming true. The disappearance of Lohachara, once home to 10,000 people, is unprecedented. Two-thirds of nearby populated island Ghoramara has also been permanently inundated. Land has also been appearing, above the waves. Question: Would the Zetas like to comment on the new land coming up in the Tonga area. Is that the start of the Pacific compression and would that underseas volcano be the beginnings of the super volcano that would likely erupt just prior to the shift? ZetaTalk Answer: We have stated that the Pacific is not the singular plate it is assumed to be, but many. Can mankind map the fault lines deep under the ocean floor? Supervolcanoes erupted in the past because the Earth was subject to massive assault when she rode out in the Asteroid Belt and herself got wholloped. Supervolcano eruptions will not occur during this coming pole shift, and certainly will not prior to the shift. As has been noted, and in the news lately, new volcanic islands are emerging unknown to man until boaters are suprised to find them. This will certainly be on the increase, and occur in numerous places in the Pacific, heating the water and increasing the ferocity of storms as a result. More likely to surprise man are sudden adjustments in the plates that compose the Pacific, with land suddenly rising or falling as a result. Hawaii, as we have stated, will rise, a trend already apparent. Just so, land can likewise fall, with the ocean rolling in. One can analyze the trends, and thus plot the fault lines under the Pacific, if clever and aware.